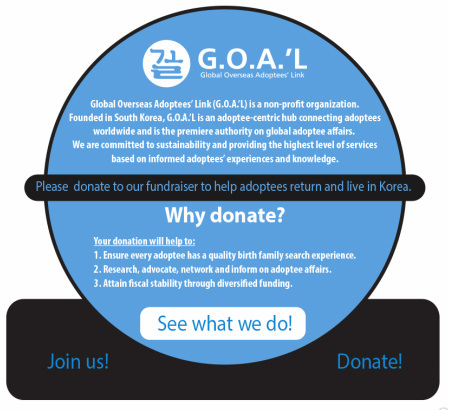 Please show your support for the only adoptee-run organization in Korea and the greater community of overseas adopted Koreans. G.O.A. 'L is continuing to improve their core services including: F4 visa/dual citizenship, language scholarships and birth family search. G.O.A. 'L depends on their members' active participation! Annual dues are crucial to support their mission and enables them to continue delivering high quality services. "By being a member you help ensure an enduring adoptee presence in Korea - so we're here when you need it!" Please click on the link on the left for further information or go to their website.